Be the first to share your favorite memory, photo or story of Jean . This memorial page is dedicated for family, friends and future generations to celebrate the life of their loved one. 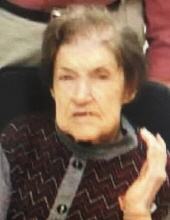 Jean Loraine Wade, 84 years of age of Lebanon, VA, passed away Wednesday, April 3, 2019 after a twenty year battle with Alzheimer’s at Maple Grove Health Rehabilitation and Retirement Home in Lebanon, VA.
She was born June 30, 1934 in Deel, VA, to the parents of the late Coy Thomas Wade and Ollie Mae Shortridge Wade. She lived all her life at Deel, VA, until she was no longer able to take care of herself. Jean was retired from Ben Franklin, 5-10 store in Grundy, VA, after twenty years of service, loved to hear Elvis Presley and had made several trips with to see him in concert. She was of the Christian faith, a loving sister and aunt. In addition to her parents, she was preceded in death by her sisters Shirley Wade and Pauline Ward and her husband J. W. Ward, and nephew Steve Ward. Survivors include her brother and sister-in-law Danny and Phyllis Wade of Deel, VA;nephew Barry Wade and wife Shelia of Hidden Night, NC, nieces Susie Ward of Clintwood, VA, Shelly Petrosky and husband Tim of Bristol, VA, Melissa Webb and husband Raymond of Vansant, VA.
She was also survived by several great nieces, nephews and friends. Funeral service for Jean Loraine Wade will be held at the Shortridge-Ramey Funeral Home Chapel of Keen Mountain, VA, Saturday, April 6, 2019 at 1:00 p.m. with Sister Beulah Shortridge officiating. The family will receive friends at the Shortridge-Ramey Funeral Home Chapel of Keen Mountain, VA, Saturday after 11:00 a.m. until the funeral hour of 1:00 p.m. In lieu of flowers, the family suggests Memorial Donations be made to Alzheimer’s Association, 355 Rio Road, West, Suite 102, Charlottesville, VA 22901. Online condolences can be sent to www.shortridgeramey.com. The family of Jean Loraine Wade have entrusted the care of their loved one to Shortridge-Ramey Funeral Home of Keen Mountain, VA.
"Email Address" would like to share the life celebration of Jean Loraine Wade. Click on the "link" to go to share a favorite memory or leave a condolence message for the family.